PCI DSS 3.2 – What’s New? What are the Best Tools to Prevent Data Loss? 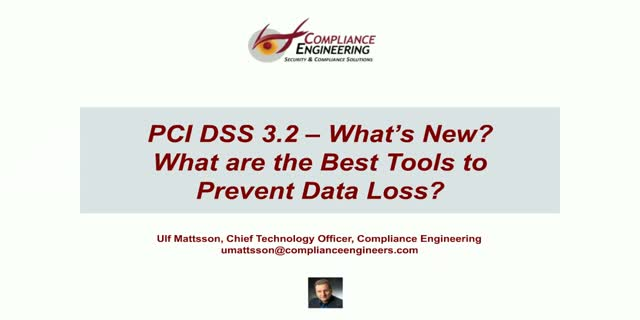 PCI DSS v3.2 provides an important and unique update on data discovery (A3.2.5, A3.2.5.1, A3.2.6) for service providers. Join this webinar and learn about the new requirements, and how implementing data discovery solutions can make it easier to validate PCI compliance. It is becoming widely recognized that “unknown” data leakage of PCI data, and more broadly other Personally Identifiable Information, within enterprises is the highest value target for the “bad guys”. While current market Data Loss Prevention tools are valuable, they do not provide for expansive and prescriptive data discovery. We urgently need more intelligent data discovery tools to dynamically limited our attack surface. This presentation will highlight some of these tools. Title: PCI DSS 3.2 – What’s New? What are the Best Tools to Prevent Data Loss?